Website redesigns are on the top of lots of churches wish lists. Willowdale Christian Reformed Church, a 140 member congregation in Toronto, Canada, was no different. And like many small churches their size, the one-page site they had didn’t meet their needs. “We wanted to make improvements and expansions because it is the main way of communicating with people inquiring about our church,” says Ministry Coordinator Susanne Zandberg. But unlike some churches that become paralyzed by the thought of diving into something that can be technologically out of their comfort area, Willowdale went to work. The church put together a team including three staff members and two other church members. Zandburg says the mix of people meant there was constructive input from various sides. But what made the redesign process work well was the early expectation that this project wasn’t going to get slowed down by inactive committees even it if meant having short meetings to discuss smaller items. 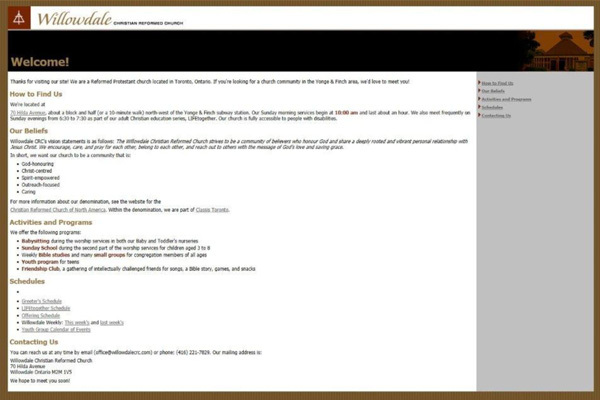 Hoping for something that was easier to update and simpler for visitors to use, Willowdale turned to a WordPress template. 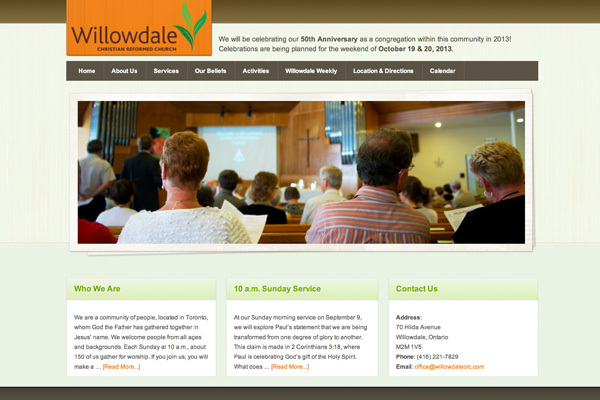 The new site gives Willowdale a more modern look. There are big pictures across the top where they can show their church and areas where they can more clearly organize information. But they still hope to do more. They plan on using their $1000 grant to add features like a sermon archive and videos. Fantastic! We’re delighted to be recognized in this way and honoured to be chosen as runner up. Thanks for creating the opportunity to participate in a contest like this. May all our efforts continue to strive to build up God’s church.